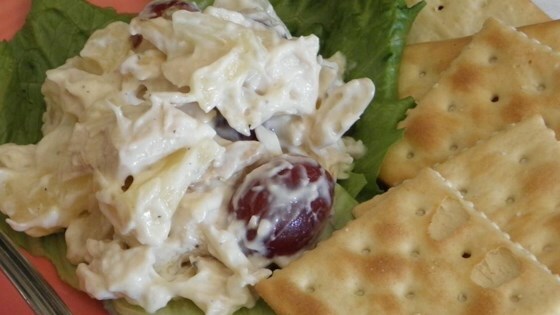 "This unusual and refreshing chicken salad is perked up by the addition of toasted almonds, tangy pineapple, crunchy water chestnuts and sweet grapes." In a large bowl, toss the chicken with the lemon juice. Cover and chill for 2 hours. Mix the salad dressing, salt, pineapple, grapes, almonds, water chestnuts and lettuce into the chicken until evenly combined. Chill until serving. Love this salad... a great thing to make with leftover cooked chicken... will make again and again! Thanks! I've used this recipe for years, and it is always a favorite at any pot-luck I attend. This is my most requested recipe, you'll enjoy it too! I loved it, and so did everyone I work with about 50 people. I added apples to this recipe and took out the salt and it was GREAT! I served this at a ladies luncheon and eveyrone loved it. The only changes I made, I left out the pineapple and added a touch of curry powder to the dressing.